The Kent County, Michigan, prosecutor says Grand Rapids officers were justified in fatal shooting of 18-year-old man during a gun battle earlier this month. 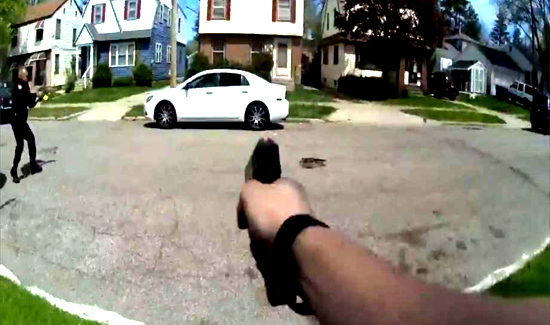 Prosecutor Chris Becker released his decision Tuesday, along with dash camera and body camera video showing the May 3 shooting of Malik Carey. Prosecutors say Carey gave a fake name, so officers waited to get a picture of him to confirm he was the person they were looking for. In the meantime, Carey and one of the officers chatted nonchalantly about Carey’s dreadlocks. But once officers confirmed Carey’s identity, things turned violent. Prosecutors highlighted portions of the video that show Carey pulling a gun from his waistband. The officers scrambled back, one of them shouting, “gun, gun, gun, gun.” Shots rang out. Police say Carey got off four shots before officers returned fire. Great footage for training and learning.